Combat in Elder Scrolls Online is rather simple but requires your attention. If you have played other TES games (Morrowind, Oblivion or Skyrim) you will recognize familiar actions and will understand everything quick. In most MMO games you have to use your mouse for changing camera angle and for some other not very important actions. Elder Scrolls Online gives a new role to your mouse. Now it controls character’s attacks and blocking. Left mouse click allows to hit enemy with basic attack. This attack is fast but does not deal a lot of damage. Power attack can be charged with holding left mouse button. Power attacks are slower but deal more damage than basic. Note, power attacks do not require stamina. Their disadvantage is just slow charging. Right mouse button is responsible for activating blocking. Hold right mouse and you can intercept all enemy attacks. Active blocking drains stamina but allows to protect your character. Blocking mode does not transform you into inactive dummy. You can interrupt enemy spell casting with a shield or weapon bash by left clicking during blocking. So you can protect yourself and interrupt enemies. Is an area where you can put your spells and access them quickly. Hotbar is your control panel. Every character has many interesting and effective spells, but you can place only 6 on your bar simultaneously (5 spells and 1 ultimate ability). These spells cannot be changed during the fight. But if you are not in battle you can remove and add abilities to the bar. Read our Hotbar page for more information. Elder Scrolls Online has a revolutionary system of rewarding players according to their mastery and impact into each encounter. It is called Finesse. The better you perform the more rewards you get. The game can estimate how good you are in battle and give you extra gold, experience or other beneficial things. It is a real reason to master your class. 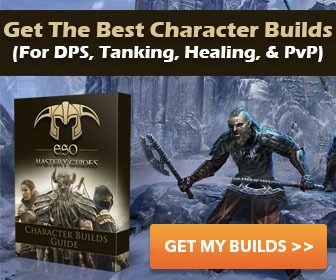 In most MMOs you have to change your builds, use different tactics and rotation switching from PvE to PvP. Elder Scrolls Online has different system. Each combination of spells (build) in ESO is playable vs. monsters and vs. other players. So you will not have to change anything.